Petfleas.co.uk was established in 2005 and was one of the first websites specialising in pet flea products and other general animal health products. As part of this, we endeavour to source the best new products available and offer any specific advice or information requested. We believe our veterinary background and experience are key factors in giving our customers confidence in the products we choose to recommend. As a mark of our commitment to quality, our staff are AMTRA (Animal Medicines Training and Regulatory Authority) qualified. We are approved by the Veterinary Medicines Directorate (VMD) for the retail supply of POM-VPS and NFA-VPS veterinary medicines by a suitably qualified person (SQP). Our premises approval number is: 7085541. You can check our approval on the VMD’s website or by contacting the VMD directly. You can verify that the above persons are a registered SQP by checking AMTRA’s list of SQP’s here. - we only supply veterinary medicines that are authorised in the UK, meaning they’re proven to be safe and effective when used as directed. 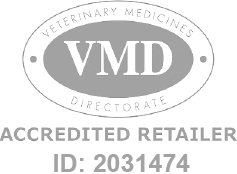 You can use the VMD’s Product Information Database to check if a product is authorised and its classification, or to search for a UK-authorised veterinary medicine. The search facility allows you to search by trade name, active substance, species, legal classification and many other options. Each product has a Summary of Product Characteristics (SPCs) that tells you all about the medicine. Alter a prescription issued by a vet, pharmacist or SQP e.g. Fraudulently produce a prescription e.g. Please note that the VMD will only consider complaints about veterinary medicines provided, not about service, delivery or cost and not about general non-medicinal products.